My husband and I have had a hard time finding a good breakfast place in Columbus. After years of going to Columbus to visit my in-laws I think he and I finally found a breakfast spot we can agree on during this last trip. He loves Waffle House and I go as a favor to him, but I prefer a place with a little bit nicer atmosphere and with a little more creative food selection. Tasi Cafe opened in the Short North area of Coumbus a couple of years ago, the fact that it’s tucked away in a back alley is probably the only reason I didn’t find it earlier. The first morning we stopped for breakfast I had a caramel roll and a side of grilled chicken apple breakfast sausage. The caramel roll was fantastic. Large, tender and the right amount of caramel and sweetness. The sausage was tasty, but I didn’t get much of the apple flavor. My husband tried their buttermilk pancakes with maple syrup and a side of regular sausage. I’m not one to be wowed very often by pancakes, but these were outstanding! I kept stealing bites from his plate. There were two plate-size pancakes that were the perfect texture and taste. Light, tender and fluffy with a rich buttermilk flavor that didn’t overpower and the syrup added a natural sweetness that was right on. We went back the next day for breakfast. I had read several reviews that their banana French toast was incredible, but I thought “it’s French toast, how good can it be?” so I had to try it for myself. It was probably the best I’ve had. It was made with fresh cinnamon challah bread, caramelized bananas and maple syrup. It had lightly crisp edges, soft, but not soggy, center and the cinnamon flavor was well balanced. I also tried the sweet and spicy bacon, but was a little disappointed. It was good quality bacon and well cooked, but the “sweet” name implied more of a candied flavor that I found missing. The only other disappointment for me was that Tasi’s doesn’t add syrup to their espresso drinks and being a coffee wimp I only like mine flavored, but they’re probably delicious. Jeni’s has fantastic creative ice cream flavors. I usually make a point to visit at least twice when we’re in Columbus for a long weekend. You won’t find your typical plain vanilla or chocolate here, the closest you’ll come is Honey Vanilla Bean and Belgian Milk Chocolate. Most of the flavors are little more adventurous and are made daily, but the staff is always more than happy to let you sample until you decide on your favorite. I’m a sucker for their Salty Caramel and the Gravel Road (Salty Caramel with smoked almonds added). Both are fantastic, but since you can mix and match flavors for the second “half” of a small scoop I usually add one of the ever changing seasonal flavors to the mix. This past weekend I had the Gravel Road with their seasonal Blackstrap Praline (bold molasses flavor with spiced pralines), fabulous! In Columbus Jeni’s has two locations, one inside of North Market and the other off High St. in the Short North. We usually go to the one on High Street because it tends to be less hectic and I can take more time sampling flavors! Yesterday morning my husband and I went to breakfast at Cafe Habana in downtown Ann Arbor for the second time in less than a month. I had been there for lunch and dinner a few times over the last year and fell in love with the Cuban food and the beautiful and rich decor. I had forgotten until recently that they also served brunch on the weekends starting at 9 a.m.
Two weeks ago I had the Breakfast Arepas, which are cornmeal pancakes filled with cream cheese, bananas and topped with a delicious fruit salsa. The soft texture of the cornmeal cakes with the creaminess of the cream cheese and the light sweetness of the fruit salsa were a great combination of textures and flavors. 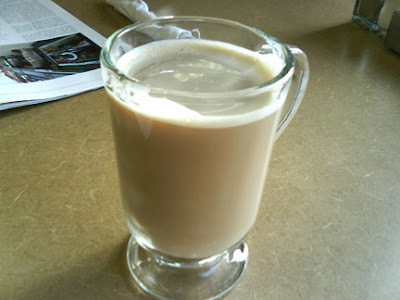 I also had one of the best carmel lattes I’ve had anywhere that morning. It came in a wide-mouth coffee cup with the perfect amount of foam and was better than the lattes I get at gourmet coffee shops. This past weekend I tried the Breakfast Burrito, which normally comes stuffed with scrambled eggs, chorizo sausage, black beans, cheddar cheese and ranchero sauce and is served with potato croquetas. I skipped the eggs and had them add extra black beans and substituted Cuban toast for the potato croquetas (which are deep fried potato goodness, but a little rich for my blood). The burrito was very tasty and I just love the slightly sweet ranchero sauce that is spooned on the burrito. The Cuban toast was a great way to soak up some of the extra sauce. I hope Cafe Habana is able to continue their weekend brunch. The restaurant is usually packed for lunch and dinner, but only one or two other tables had customers both mornings we were there. The staff didn’t use the lack of customers as an excuse to slack off. Instead, they are very attentive and knowledgeable. On one hand it would be nice to see the restaurant’s brunch business pick up, but at the same time it’s nice not having to wait in line and have a great place to go that feels a bit like a secret! If you get a chance and are looking for something a little more adventurous than your typical bacon and eggs, try out Cafe Habana this weekend. Here’s my idea of a good Friday after Thanksgiving: sleep in, avoid the malls and stores at all costs, eat. My husband and I went to our favorite breakfast spot in Ann Arbor, Cafe Marie. I almost always get the make-your-own skillet with mushrooms, dried cherries and hollandaise sauce with the cinnamon-raisin toast. 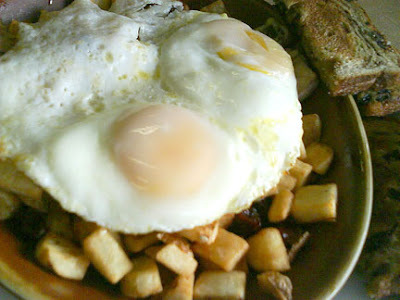 It comes with roasted potatoes mixed in and fabulous braised eggs on top. If you’re in the mood for something different, they always have a great selection of both traditional and non-traditional breakfast items. I also had their seasonal Pumpkin Spice Latte which is pretty tasty, too. Forget Angelo’s and forget Northside, both are overhyped. The service and food are always great at Cafe Marie’s and the food is more interesting than greasy eggs and overcooked sausage. If you haven’t been yet, stop by; you wont’ be disappointed. For lunch we tried a newer cafe/sandwich shop in Canton, Day Dream Cafe, near the new Target on Michigan Ave. I had spotted it the other day when I went shopping and looked for a menu or website online and was disappointed when I didn’t find one. They have a page on FB, but no menu was posted their either. They had lots of fantastic reviews on Yelp so we decided it was worth checking out. 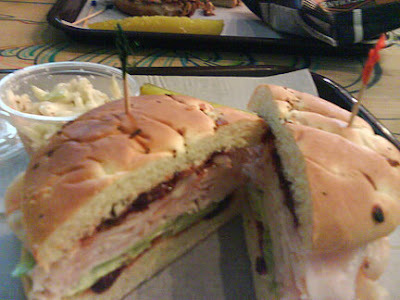 I tried the Traverse City Turkey sandwich that comes with a dried cherry jam. 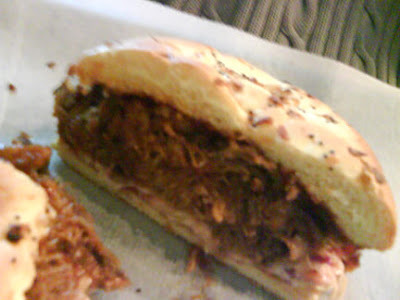 The jam was delicious, but I have to admit though my sandwich wasn’t bad I was a bit jealous after trying a bite of my husband’s barbecue pulled pork sandwich. It tasted really fresh and had the perfect blend of spices and sweetness. The barbecue sandwich came with coleslaw on top, my sandwich came with a choice of side and I chose the coleslaw as well. It’ was freshly made and lightly creamy, very delicious! The sandwich menu is pretty extensive and is a mix of traditional choices and a few more adventurous ones and a lot of London Broil choices. In addition to sandwiches they have a variety of baked goods and even pierogies! They’re starting to expand their breakfast choices on the weekends to include different varieties of pancakes and French toast. The services was quick and friendly and the atmosphere is laid back. We’ll have to give their breakfast a try next!